Going into The Game last Saturday in Ohio Stadium, many expected the vaunted Michigan defense to show up as the most prepared and competent unit on the field that day. Despite the fact that they'd be facing a top-5 offense, the Wolverines appeared to be historically great after holding opponents to the lowest output of any FBS defense in the past seven years. But whether it was due to Ryan Day's familiarity with Brown going back to their days in the northeast - Day played and coached against him every year while at the University of New Hampshire before the two eventually worked together on Steve Addazio's staff at Boston College - or simply because Urban Meyer's staff truly takes a 365-days-a-year approach to prepare for this rivalry game, the Buckeye offense had a clear plan to expose the talent advantage they held at a handful of positions and beat Brown at his own game. As quarterback Dwayne Haskins said following his record-setting performance, "We seen a lot of man coverage, [a] lot of one high, so we knew that we could get a lot of one-on-one match-ups and crossing routes on them. And made some plays when it mattered the most." 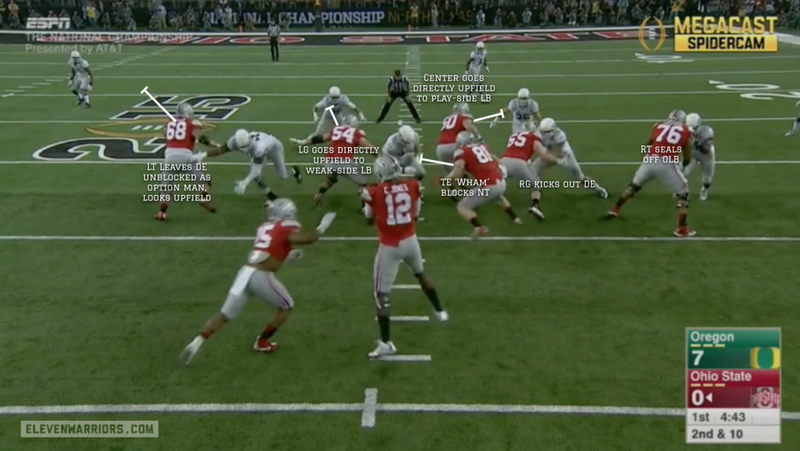 The crossing routes, specifically, came from Day's Mesh series that was installed last season and has remained one of, if not the single most important passing concept in the Buckeye playbook since. Specifically, the Buckeyes looked to expose a handful of matchups against the Wolverines' heavy reliance on man-coverage, which left lesser-talented players like nickelback Brandon Watson (#28) trailing quicker OSU wideouts or linebackers against scatback Demario McCall. Brown is famous for having answers to handle crossing routes (as you'll see below), which meant that Day also had to include the perfect counter to the regular Mesh, as shown in the final play above. While the outside receiver to the bottom still runs the middle hook route, the two would-be crossers stop their route short and turn them into pivot routes, breaking back outside. This was a tactic often employed by Day's mentor Chip Kelly when both worked together with the Philadelphia Eagles and San Francisco 49ers. Expecting Brown to play a great deal of man-coverage with a single safety deep in the middle of the field, Day used this tendency against the Wolverines. Instead of simply avoiding some of Brown's talented linebackers, Day and co-coordinator Kevin Wilson called for a heavy dose of Fly motion to remove a linebacker from the middle of the field before attacking the space they'd just vacated. Though Brown had two all-conference cornerbacks in David Long and Levert Hill, neither played a big role in Saturday's blowout win by design. Day and Wilson clearly felt they had a talent advantage at the H-receiver spot, where Parris Campbell and K.J. Hill combined for 10 touches, 243 yards, and three touchdowns. 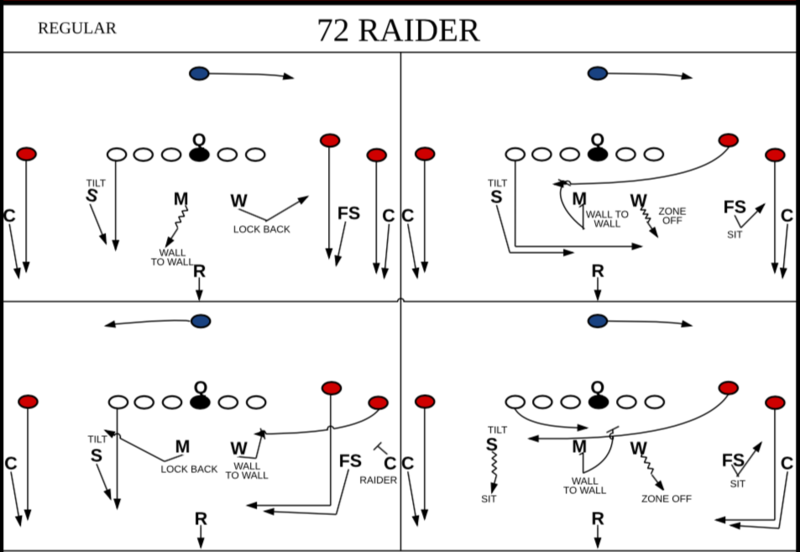 Knowing Watson wouldn't be able to keep up with that speedy duo from the slot, Brown was forced to switch to a single-high pattern-match scheme he calls Raider, which is nearly identical to the Rip/Liz concept developed and made famous by Nick Saban. In the scheme, Brown asks the inside linebacker to the opposite side of the crossing slot to become a 'wall-to-wall' defender, picking up the crosser like a zone defense. However, even with Devin Bush lined up in this spot, the speedy linebacker wasn't able to catch up to Campbell once the receiver was in stride. "He is one of the fastest players in college football," Urban Meyer told the media Sunday as he looked back on his team's dominant performance. While Haskins did connect with Chris Olave and Johnny Dixon on a pair of deep balls, the vast majority of his 396 passing yards came on crossers like these. In order for him to have enough time to make those throws, however, the Buckeye offensive line had to hold their water against a Michigan front that regularly brought five-man pressures, even on early downs. "The biggest responsibility for me all week was to be able to pick up blitzes and protection because we saw a lot of different fronts and exotic looks," Haskins went on after the game. "I spent hours in the film room just trying to figure out how we can pick the blitzes up. And once we picked it up, receivers make plays, and I'm going to put it there. And it was a great overall team effort today. The Wolverines not only failed to get a sack but weren't even able to register a single QB hurry. Yet while the game was won through the air, the Buckeyes' front five put the game away on the ground in the second half. Once again, Day and Wilson got the looks they expected from Brown's defense, manipulating them with motions in and out of unbalanced formations. This action may have been less entertaining to watch, with Haskins often looking to the sidelines for instructions as the play clock ran down from a Freeze tempo, but it allowed the Buckeyes to take advantage of an out-leveraged defense that often lacked numbers inside the box as a result. 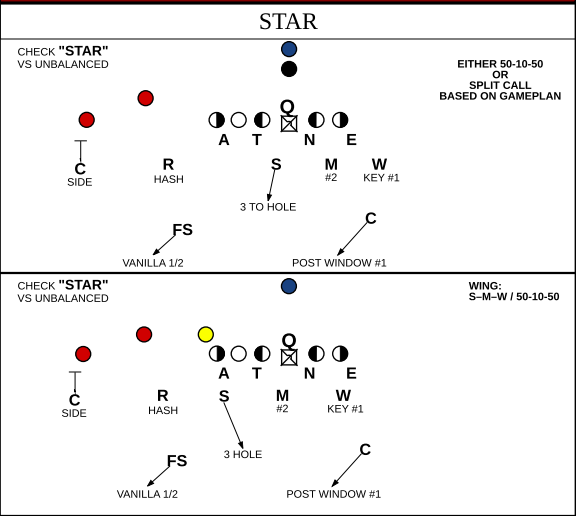 While the unit struggled to find traction with their Crunch split-zone scheme early, Wilson and Day adapted by including an old tactic not seen for some time in Columbus - the Wham concept - which uses the tight end in an off alignment to trap the nose tackle while the center and guard get upfield to take on the inside linebackers. But the biggest play on the ground (though it would officially be ruled a pass), came from Campbell, who hit the Wolverines as they were caught out of position. Thanks to an unbalanced formation that placed both offensive tackles into the boundary, the Michigan defense bumped down in anticipation of a handoff to that side. Specifically, star defensive end Rashan Gary lined up inside Buckeye tight end Rashod Berry, making it nearly impossible for him to seal Campbell inside as he came flying across the formation on a Jet sweep. From there, it was a race to the edge between Campbell and safety Josh Metellus - a contest the receiver rarely loses. As you likely already know, this masterful piece of planning resulted in 62 points, the most ever surrendered by a Michigan team in regulation. Just as impressively, the Buckeyes' 567 yards of total offense was the largest total given up by Brown since he first became an FBS defensive coordinator in 2009. While the Buckeye offense has had its struggles this season, both on the ground and in the red zone, its performance in the biggest game of 2018 may go down as one of the greatest in school history. "I just think Ryan Day and Kevin, everybody, I think we're the second offense in America," Meyer told reporters following the game. "And I know we struggle all the time or whatever. But second offense in America just put a bunch of yards on the number one defense in America."